Remember the one from the 90's, it had Stallone doing his best Demolition Man remix? Well, don't let that one keep you from seeing this one. It's up for streaming on +Netflix in HD so you can see it safely now without regretting it if you wind up not liking it. ..that other one sucked, this one's pretty good. Karl Urban, plays the title character and he does a pretty good job, as long as an actor can play tough, speak a few words and have a square enough jaw I think anyone could have played this role. The helmet never comes off, which is true to the comic it is based on so it was nice to keep that in the film. This is an action film, so if you're watching it for any kind of acting you won't like this one. It's pure blood and guts for most of the sequences and any action/ comic book fan should not be disappointed with this film. The plot line felt a little familiar, almost similar to The Raid, criminal city, criminals in a tower like fortress, "the law" is trapped inside and they have to fight their way out. The reason they go in is for a multiple homicide inside of the tower called "blocks" and it turns out the new future narcotic referred to as "slo-mo" in the film is being manufactured and distributed there by the queen gangster known as "Ma-ma". She's actually not very intimidating at all and a little corny, but she doesn't ruin the film. While Dredd is going through all this he's partnered with a rookie played by the very hot Olivia Thirlby as Rookie Judge Anderson. Her character's a mutant with some psychic ability to extract information by getting in people's minds. She's considered a risky hire so they partner her up with Judge Dredd for review, it's not a major plot point but makes for a good "buddy cop" light mix. What is nice is that there was no need to throw in any kind of "love interest", it's nice to see Hollywood maturing and recognizing that doesn't always have to be present in every movie. 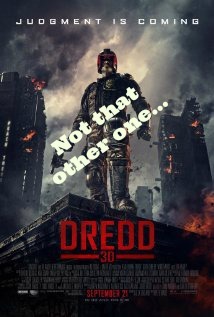 Dredd is rated R for violence...and more disgusting violence, go check it out on Netflix.